Veneers are customized, wafer thin pieces of ceramic that fit over the front surface of teeth. The veneers are designed to look like naturally perfect teeth. They can align teeth, close gaps, lighten teeth and even repair broken down teeth. Dr. Giroti follows the principle of holistic dentistry which means that often we don’t even need to remove any of your natural teeth at all! Porcelain veneers are wafer-thin; custom made ceramic facings or shells. 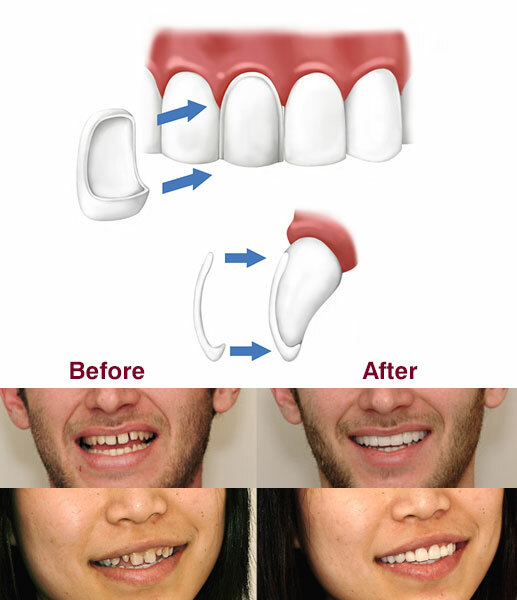 Veneers can be used on their own as per the patient’s requirement or as part of a bigger smile makeover. Although porcelain veneers are thin, they are incredibly strong once they get bonded to the tooth. At Sterling Dental Clinic, we only use the latest, most durable ceramics. Porcelain veneers should look their best for around 10-15 years. After that time, some of the surface lustre can be dulled, or it’s possible that margins become more visible. Even in these rare cases, tooth replacement is likely to be more of an option rather than a clinical requirement. What is the clinical procedure for veneers? Ideally, any dental procedure should be carefully planned and then perfectly executed but with porcelain veneers, it’s more important than ever. Sterling Dental Clinic has had vast experience in placing porcelain veneers to the best of standards so patients can be completely sure that they are getting the best treatment. The great thing about the above approach is that both dentist and patient have lots of opportunities to see and discuss how things will look - this way everyone knows the result is going to be perfect!